Extending Outdoor Spaces in Great Shelford. The owners of this quirky cottage in Great Shelford love sitting in their garden but in such a seasonal climate, their opportunity to truly enjoy the outdoors is limited. So they set about finding a way to feel as if they were sitting in the garden while being sheltered from the elements. And answer was of course a conservatory from the Cambridge Conservatory Centre. But not just any conservatory. As lovers of natural and natural materials, they wanted a conservatory that would feel natural and sit comfortably with the abundance of foliage that they love so much. We designed a simple Oak Conservatory and pergola that would allow them as much light and nature as possible. By keeping the framework to a minimum we were able to create an indoor space that feels just like sitting under an outdoor pergola. 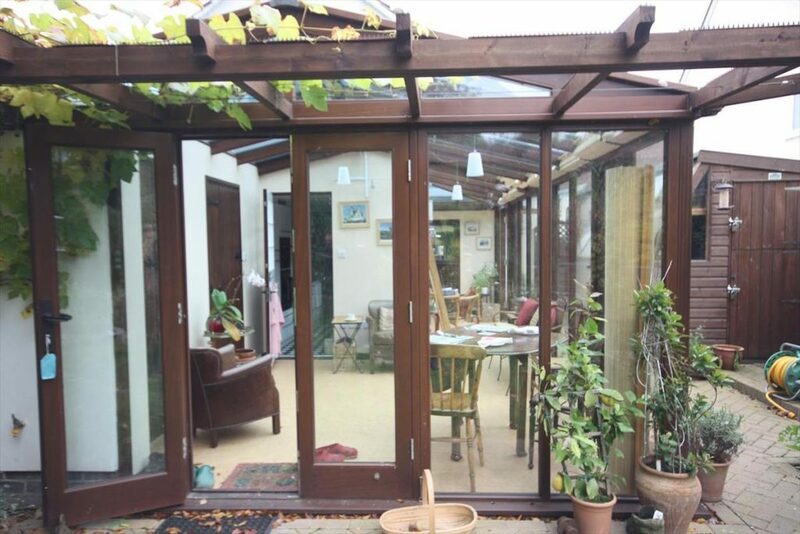 And with the frame extending outwards into the garden to form a pergola on which a grapevine grows, the lines between indoor and outdoor are completely blurred. 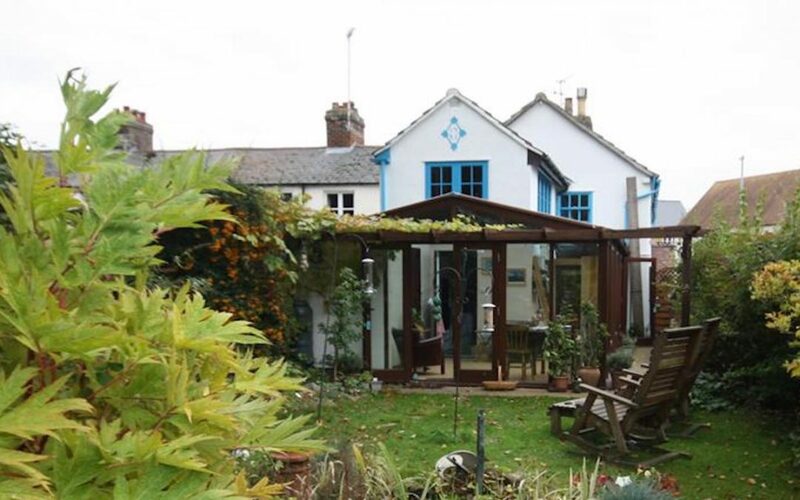 In fact you have to look twice to see the glass of the Oak Conservatory hidden between the simple framework! But despite it’s almost invisible appearance, this Great Shelford Conservatory offers everything the owners were looking for. Although not a huge space, they have added a table and chairs that allows them to enjoy meals, read the paper or just chat with friends in a light filled space that extends the walls and brings the garden in. A couple of well loved and comfortable chairs suggest the owners spend a lot of time here. And that’s what its all about. Creating spaces for living! A series of potted plants are placed right next to the conservatory glass accentuate the feel of being in the garden. 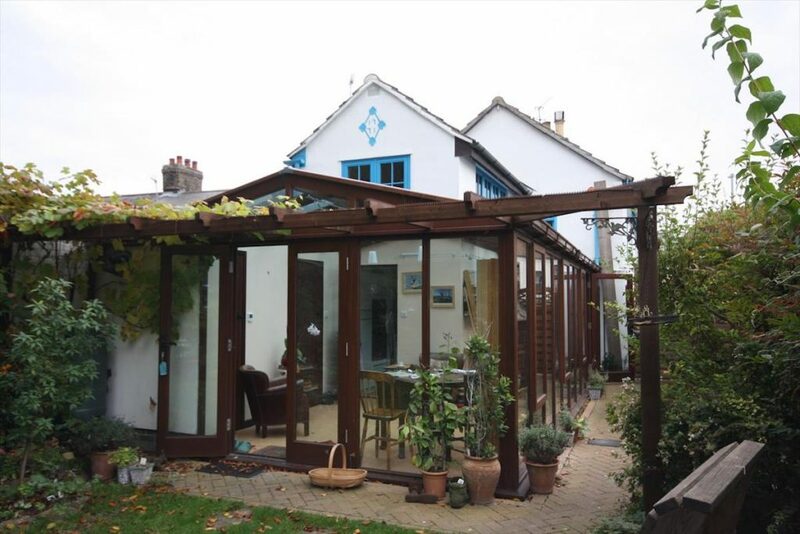 As you can see in the image above, the new Oak Conservatory and Pergola extension provide a fabulous link between the home and garden. Filled with potted plants, a light tiled floor and simple French doors, this space sits in the garden as if it was designed to be a part of it. Which it was of course!